After four seasons of romantic tension, writer Rick Castle (played by Nathan Fillion) and Detective Kate Beckett (played by Stana Katic) finally revealed their feelings to each other and got together to the delight of many TV fans. The couple, however, are still hiding their relationship from their co-workers. 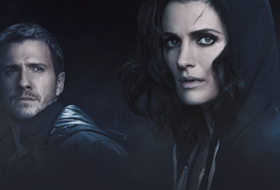 Up next this season, the show will change up its format a bit for an episode featuring a documentary crew that turns its cameras on Castle, Beckett and their fellow NYPD detectives while the team attempts to investigate the murder of the lead guitarist of a rock band. The episode, called “Swan Song,” is set to air on November 12 and Katic talked just before a Q&A session to OTRC.com about the episode, the show’s romance and Detective Beckett’s wardrobe. But first, the actress talked about the show’s devoted fan base. The “Swan Song” episode also features guest star C. Thomas Howell of “The Amazing Spider-Man” and “Southland” as the leader of the cult the guitarist belonged to but wanted to get out of. 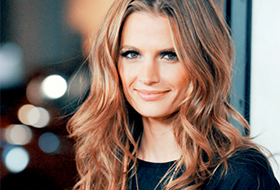 Katic said the documentary crew aspect of the episode provided a challenge for her because she had to speak directly to the camera in some scenes.